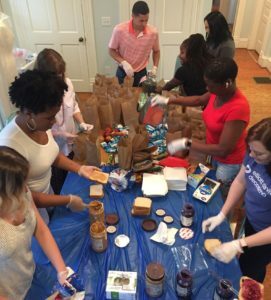 Supporting the community through volunteerism is a value more and more companies in the Charlotte region are intentionally including in their workplace culture, and rightly so. 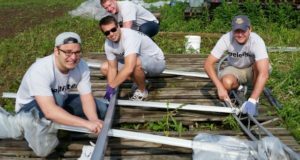 Deloitte’s 2017 Volunteerism Survey revealed that 89 percent of employees believe companies sponsoring volunteer activities offer a better overall working environment than companies that don’t. At Ingersoll Rand, for example, the company holds a week-long “Days of Caring” where employees engage with United Way partners to complete volunteerism projects across their community. “Ingersoll Rand is a socially responsible company, so making a positive impact on the communities we are part of is a goal we share as a company and as employees,” said Scott Krull, vice president, global commercial leader at Ingersoll Rand. Whether it’s tutoring in an elementary school classroom, beautifying a nearby neighborhood or building new tricycles for children, providing year-round opportunities in the community on an individual and group level contributes to higher employee engagement. “Through our volunteer efforts, we hope to foster economic mobility in our communities, which in the long run creates a workforce that helps us to maintain a positive presence in these communities,” Krull said. When companies foster a culture of giving back, they create a purpose-filled environment that empowers their employees and brings forth a sense of responsibility. In fact, Deloitte’s survey showed that two-thirds of employees believe volunteerism provides an improved sense of purpose. Through hands-on and skills-based workplace volunteer opportunities, employees can see the impact they and the company are having – from improving early education to eliminating hunger to building healthier communities. 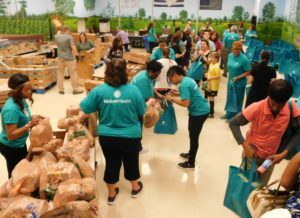 Elliott Davis holds quarterly volunteer service days in Charlotte benefitting local nonprofits, schools and neighborhoods. Ingersoll Rand and Lowe’s Home Improvement engage their employees to volunteer across Mooresville and Lake Norman for United Way’s annual Days of Caring each fall. And for the past 12 years, Wingate University has participated in and served as the launch site for United Way’s annual Union County Day of Caring. 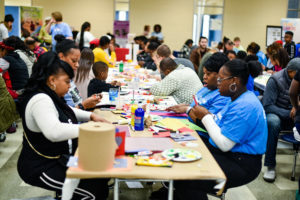 These large-scale events connect hundreds of employees and community members with projects that serve neighbors in impactful ways. As companies provide ongoing opportunities to participate in social responsibility, employees are encouraged to connect socially and engage with others in meaningful actions. 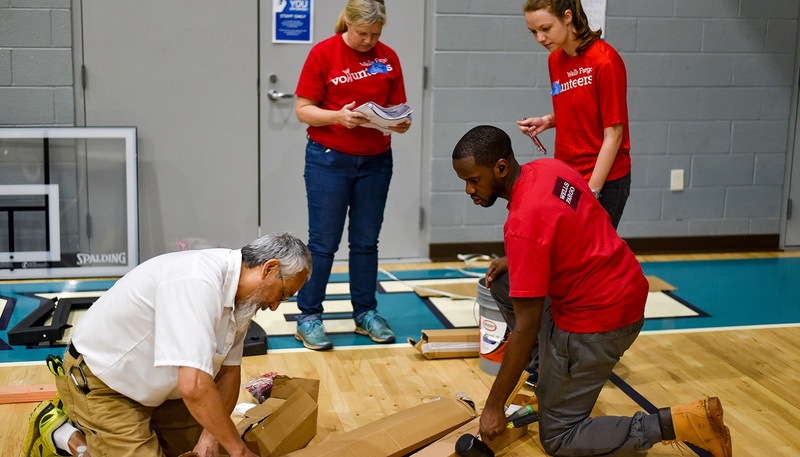 Atrium Health sponsors “Season of Caring” events in each of the five counties included in United Way of Central Carolinas’ footprint, helping to recruit more than 1,000 volunteers for local acts of service. When team members interact outside of company projects and day-to-day tasks through volunteerism, they’re able to bond across departments and gather around a common cause. Projects provide employees an outlet to cultivate relationships while giving back to the community. These connections help build interpersonal skills and rapport in the workplace. Stepping away from workspaces and into volunteer projects also gives employees a chance to learn new professional skills that can take their careers to the next level. Deloitte’s 2016 Impact Survey indicates that volunteering experience may play a big role in building leadership skills considered to be “must haves” for successful leaders. Customer service, time management, delegation, listening and analytical skills are just some of the skills gained through volunteering that are transferable to the workplace. Employees also can gain experience in problem-solving, motivation and entrepreneurship. 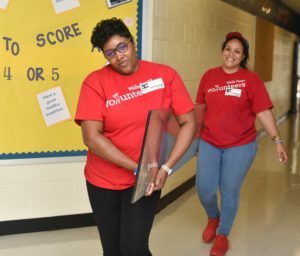 In 2017, Wells Fargo employees volunteered 185,000 hours in the Charlotte area, said Jay Everette, senior community relations manager at Wells Fargo. “We serve the community’s greatest needs through both our financial and human capital,” Everette said. During Wells Fargo’s annual Days of Caring, engagement opportunities for employees not only include hands-on projects, but also board training to learn more about what it means to serve on a nonprofit board and how to get more involved in the community. Companies that rally their employees to volunteer may see added benefits like boosts in morale, workplace atmosphere and brand perception, according to the Deloitte survey. Employees, especially millennials, who participate in corporate volunteer activities are more likely to be loyal, proud and satisfied, as compared to employees who hardly or never volunteer, the survey showed. Workplace volunteer programs also can increase interest in the company from potential employees. The Millennial Impact Report’s most recent findings indicate more than half of people consider a company’s support for social causes an important factor in accepting a job offer. Many companies, therefore, offer team members time to participate in volunteer opportunities during work hours, helping build engagement and strengthen corporate philanthropy efforts. 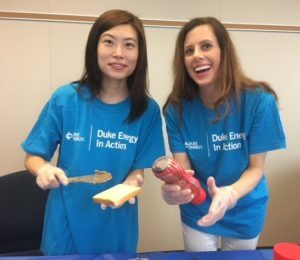 Throughout the year, United Way’s partnership with companies including Duke Energy, Enterprise Holdings and TIAA provides employees with customized volunteer opportunities and event sponsorships. “We appreciate our partnership with United Way because we are able to engage our employees in volunteerism and giving back to the community, which is so important to today’s employee,” said Kaniche Bennett, group generalist/TD manager at Enterprise Holdings. There is no better way to create change than to volunteer right where needs are being served daily. United Way brings people together to build a stronger community through year-round volunteer opportunities, making it easy for individuals, families and groups to get involved. Projects range from recurring opportunities like sorting donations, tutoring children and landscaping to larger community-wide days of service and playground builds. With flexible opportunities for companies, employees and others, volunteers can choose from projects based on their interests and that fit their schedules. United Way works with companies to create ongoing engagement opportunities for employees, such as daylong community service celebrations or recurring place-based projects. 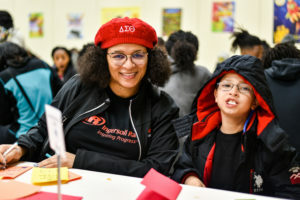 Through place-based opportunities, volunteers foster long-term impact in neighborhoods through projects like adopting a kindergarten classroom or elementary school for tutoring. Volunteers looking for a way to put their specialized skills and talents to good use while giving back to the community also can participate in skills-based volunteering, completing tasks like accounting, business consulting, marketing services and more. Not to mention, skills-based volunteering is a great way to network with peers and fine-tune knowledge while making an impact. United Way also hosts signature events several times during the year to celebrate volunteerism. These fun, family friendly events unite hundreds of people and provide companies with volunteer and sponsorship options. In January, more than 1,200 volunteers took part in service projects across Charlotte during the annual MLK Call to Service, which honors Dr. Martin Luther King Jr.’s life and legacy of service. Every April, community members and corporate groups also turn out for Hands On Charlotte Day to celebrate volunteerism by lending a hand at diverse projects across the city. Other special events include United Way Volunteer Week in the spring, Live United Day in the summer, Days of Caring in the fall and the Charlotte Playground Build in the fall/spring. These opportunities engage volunteers in meaningful ways and provide a taste of United Way’s year-round volunteerism.